Since I learned so much from this image (thanks to the Raydream-L list! ), I wanted to put some of what I learned in this page in hopes that it helps others with their lighting and pursuit of realism. This is my original version of the image. It has an ambient light setting of around 70% and is lit by two spotlights. LIGHTING: In this version, I turned the ambient light setting down to 14% percent. It seemed that the high ambient light was causing the objects to look too flat. There are 5 different spotlights to lighting the scene. (pointed at the glass, vase, candies, back corner and back wall) Each spotlight generally had a high angular fall off and a medium to high setting for distance fall off. Each light had soft-shadows turned on with a diameter of 2. 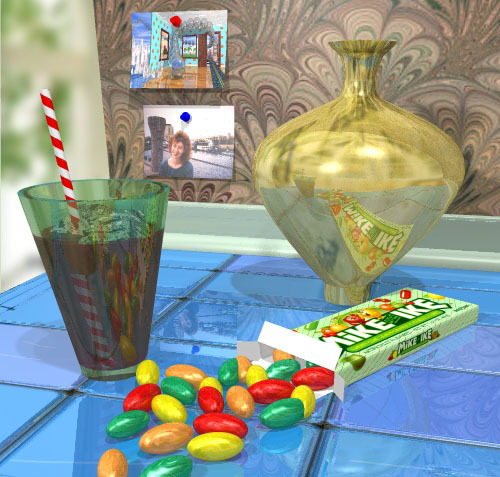 COLOR: I toned down the colors of the blue tiles as well as the candies and thumbtacks so they wouldn’t look so saturated. 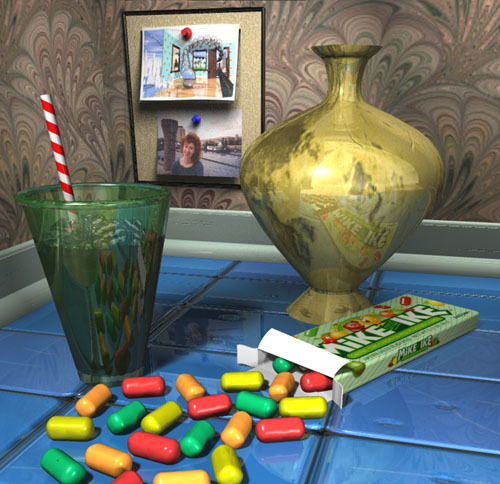 I also reduced the reflection of the tiles and the vase to make it look less “perfect”. In real life, a scene like this would have more muted colors. SCRATCHES: I added several dings and scratches to the counter tiles as well as the baseboards and vase.